I have noticed that when I write a “What I Am Reading Right Now” post, I get a lot of views and clicks. People seem to like reading about what I have read and my subsequent responses. At the same time, these posts do not seem to fit the theme of my blog, “Reading By Example”. Yes, the posts are about reading, but they are more of a roundup of current events, a brief summary of what you might want to know as a relevant educator. So here we have “Theory and Practice”. As of today, it will serve as a summary of what I am reading right now. It will remain separate from this blog, in that it has a tighter purpose. This blog will also be more open to sponsors, such as businesses and individuals looking to promote their product. Having just published a digital book myself, I can appreciate the desire to share our creations with a larger audience. Penscrach is apparently a very popular theme. It is free. 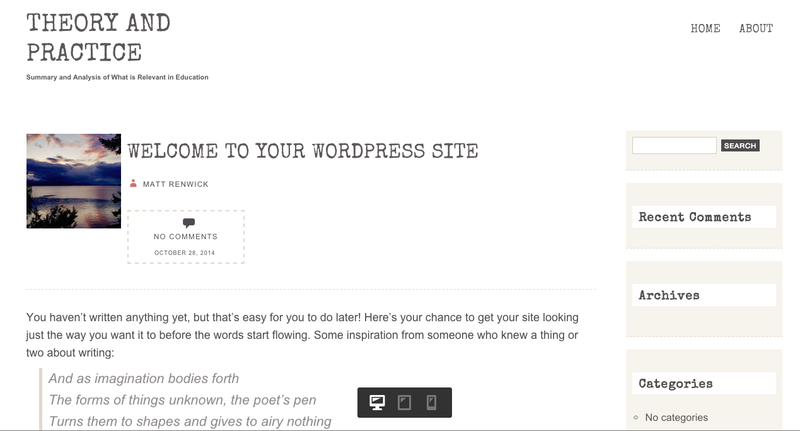 This theme is not free, but the font looks great. 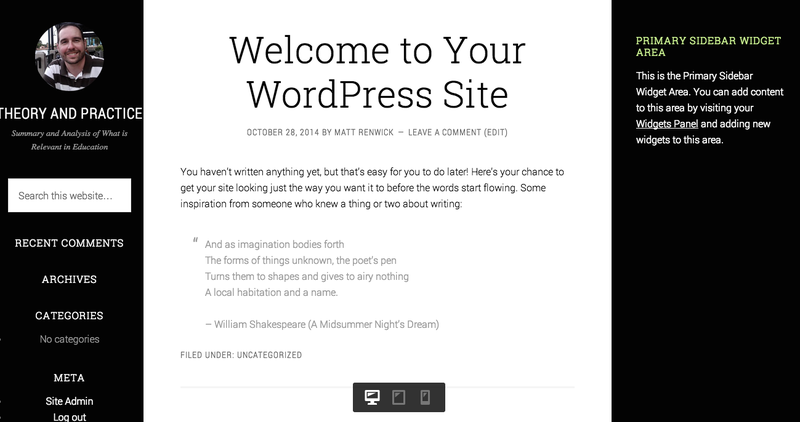 Another paid theme, which allows for two sidebars and a small image next to the title for the blog. What do you think? Please share your opinion in the comments. I like the middle one. I agree that the font looks great. 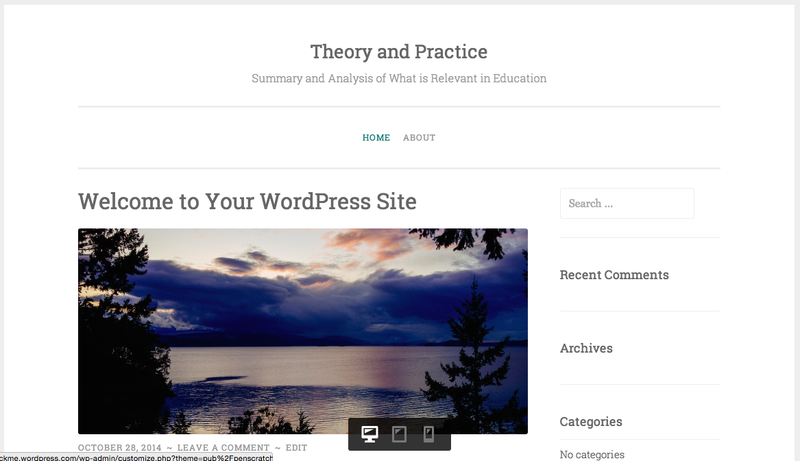 However, I’m more excited about the content of this new blog than the look – so I won’t be disappointed if you opt for the free theme! I appreciate your feedback on this topic, Dana. Presentation of writing has become a bigger deal in the 21st century. But you are right – the content is what is most important. I hope you approve! I agree with Dana – I like the middle one too! The content sounds like fun learning! Thank you Fran. I appreciate your feedback on this topic. I’m hoping this venture will be an interactive one, where valuable members of my PLN such as yourself will add to the posts and make them more valuable than originally planned. I liked the first one! The serene photo seems very relaxing in a busy world. When I think of my own learning, I’d like to be in a serene state of mind so learning sticks! The voice of dissent, or reason? 😉 All of the suggestions have been very helpful. I agree with you Samantha, about the dark borders better featuring the content in the middle. This is the priciest of the three themes, but maybe it is worth it. Also, I usually post around twice a week. Now of these posts will be on “Theory and Practice”. Most of what I share is in the 300-500 word range, so that makes writing regularly doable. I prefer the middle one, but I also love free. 🙂 I will read it regardless. Thanks Michelle for the feedback. I’m also a fan of the look of the third. While I really like the look, I think that the two sidebars need to be well utilized. For the third to be your choice, I think that you need to have a “want” or “need” for the opportunities that they afford you. As you noted – it’s the most expensive option. Get your money’s worth!! I’m looking forward to seeing where you go with this! Good point Christy – I do need to utilize the sidebars well. Thank you for sharing your opinion here.